An enormous thank you to YOU! You are fantastic. Thank you from the bottom of my oldest and dearest sugo pot, from Victor’s heart which is even bigger than my sugo pot and from all our team for all the beautiful words of encouragement and congratulations following our changes at Contini George Street. We know it’s been a bit of a shock for some of you. Naked ladies and gentleman on our walls, new menus, new dishes and new faces……..but you’ve trusted us, embraced our changes and the comments have been fabulous. So many happy guests. Now it wasn’t that you weren’t happy before but we wanted to make you happier. All the improvements we’ve heard you ask for over the years we’ve tried to tackle in our new look. Noisy, new sound system thanks to Simon at Loud & Clear and a playlist from Jennies amazing musician husband Ali, we’ve not had one complaint about the music. No more screaming Sinatra just mellow soothing background entertainment. More booths. We’ve got so many more booths there are too many to choose from. New lighting – we’re now as cosy and romantic in the evening as we are light and fun during the day. New ladies, yes we’ve even changed these, no more black shiny doors or fingerprints. More exciting and more new dishes …… yes lots more flavours and Italy showcased more than ever. Remember we’ll be changing our menus every 6 to 8 weeks so if an old favourite isn’t on the menu don’t worry it will reemerge but in a lighter and more creative space than before. I was asked why did you change? For exactly the reason that we never opened a chain of Centotre restaurants and The Scottish Cafe and Cannonball have been developed, Victor and I love creating and changing and evolving. That what keeps us interested and dedicated to what we do every day. My parents inherited my grandmother’s restaurant. For almost 40 years they served the same dishes every single day. There was no competition and no need to change very much. Then when the holiday craze of going to Spain instead of Seton Sands had anchored itself very firmly in the packaged sunshine market they had to change. It took courage and conviction to change a 200 seater restaurant into a 40 seater cafe but my mother always said it was the best thing they ever did. They caught up with the times. I remember we even got a cappuccino machine in the early 80’s. A revolution not an evolution. I feel our change is far more of an evolution than a revolution. Woman and Home was as exciting a column for recipes that you could find in my mother’s day and the TV chefs of their day were the Fany Craddock’s and then the Robert Carriers. Our food environment is in a different world to what our grandparents and parents gave us. We travel more, we read about food more, we are more knowledgeable about our health and wellbeing than ever before. We expect more. So we’ve decided to deliver more. Highlights have been the lardo. Such a traditional ingredients but lifted with fresh grapes and biscotti. I love the salame: Calabrese salame with grilled aubergine, a little fresh mint creme fraiche, pomegranate and pistachio. The pane al forno is a traditional Puglian recipe made with a little potato it’s as light as a feather with the creamed macadamia and the world class Fontodi for dipping – delicious. The lamb finished with creamed anchovy and coriander is a winner and the poached cod in olive oil is a new superstar. Not to forget our raw salads which have been taking everyone by surprise. Cauliflower may be the winner with the venetian spiced walnuts. Our cheese board is fun and those shards of pane carasau add a little touch of class. So much to share and I forgot to mention our separate vegetarian menu – yes a whole menu dedicated to our non meat and non fish eaters. Loads of choice for everyone. We’ve taken the skill of our team, our knowledge from our suppliers, embraced a healthier diet and delivered a far tastier and far more exciting experience. I’ve said so many times over the last four weeks. 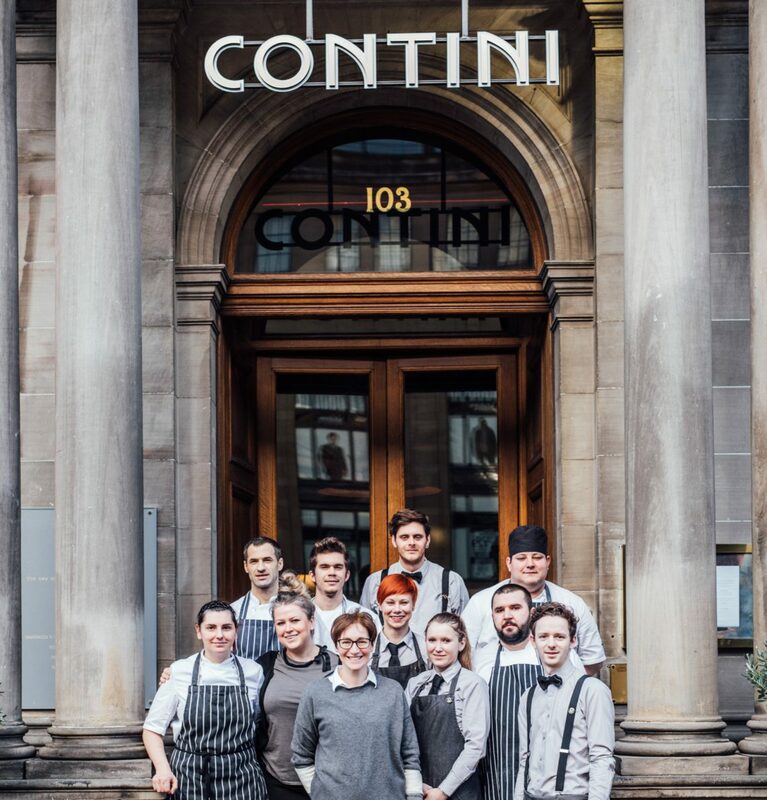 If we’d opened a Scottish restaurant in Rome 50 years ago and then opened one today, they wouldn’t be serving the same food but they may be using many of the the same ingredients. We are exactly the same. We are still proud to showcase Prosciutto di Parma DOP, Parmigiano Reggiano 24 months matured, Vialone Nano Risotto, Burrata, Mozzarella di Bufala from Campania but presented with the skill that we now have around us and the customer desire for an even better restaurant experience. If you’ve not tried it yet, we look forward to welcoming you, and we look forward to you embracing the change and going for it! Remember our team want you to have the best experience and to love our food. We’ll recommend dishes that compliment our new flavours and formats, trust their suggestions.